Colleen Dilenschneider is a Generation Y museum aficionado and the Chief Market Engagement Officer for IMPACTS, a global leader in predictive market intelligence. Colleen works with zoo, aquarium and museum leaders (ZAMs, affectionately) to ensure the long-term relevance and financial success of their visitor-serving organizations. She specializes in the evolution and deployment of innovative community engagement practices informed by proprietary data that both identify and predict trends in the market’s behavior. I’m the Chief Market Engagement Officer for a predictive technology company called IMPACTS – so I do not work in a museum – but I do work with several museums! My team works primarily with the Company’s nonprofit, visitor-serving clients to help them develop digital marketing best practices and strategic marketing plans informed by market data and predictive models. Often, the data about market trends touches nearly every aspect of museum management, and I work closely with executive leadership to “future-proof” the organizations with which we work. I’m also dual-based out of London and Chicago, so I get to do a lot of traveling. This global perspective with access to trend data means that I am always on my toes and things never get boring! I have a bachelor’s degree in English and Visual Arts from The University of Chicago, and a Master of Public Administration with a concentration in Nonprofit Management from the University of Southern California. [Cue: nostalgic sigh…] It happened at The Art Institute of Chicago in the summer of 1995 at the “Claude Monet: 1840-1926” exhibit. I was ten years old and my mother took me to see the exhibit on my “Special Day” one year. As the oldest of four, I don’t remember having much one-on-one time with my mother, but every summer for a few years she would take each of us to downtown Chicago (I grew up in a Northern suburb), and we could do whatever we wanted and just spend the day with her. My mother is an artist herself and I was always an art lover (and a wanna-be artist) so it was indeed a perfect, special visit. We took the train downtown, visited the exhibit (I still remember feeling almost dizzy with excitement seeing so many Monets in one place for the first time!). Then we got our hair done at the Elizabeth Arden Red Door Salon and had tea at the Four Seasons. What a day! …Those last two details may seem superfluous to some, but data suggests that the satisfaction of museum visitors’ experiences are put in context of the day as a whole. It might be impossible for me to isolate that single, sticky moment of walking into the exhibit (a moment which played such a starring role in determining my future interests and career path) from the radiance of the entire day. My blog is “Know Your Own Bone.” (It’s from the quote from Henry David Thoreau, “Do what you love. Know your own bone; gnaw at it, bury it, unearth it, and gnaw at it still.”) I started it in 2009 borne of the terror associated with leaving the full-time museum professional world to be a full-time graduate student. I originally began writing it to reflect on my experiences in graduate school and also to keep a digital presence in the “real life” museum world. The role of the blog changed for me over time as it changed for other people. At first, it served to help me unearth my own bone. Now it’s more of a resource to provide “gnawing bones” for folks looking to keep museums relevant in an increasingly competitive market (i.e. meeting financial bottom lines and sparking those life-changing ‘sticky’ moments in others). I blog about the evolution and deployment of innovative community engagement practices informed by proprietary data that both identify and predict trends in the market’s behavior. (It’s cool, I promise…or, at least I’m a nerd and I think it is!) Essentially, Know Your Own Bone focuses on your audience and how they think and behave – which makes it a bit different than other blogs in the sense that Know Your Own Bone focuses on museums as the world sees them (“outside-in”) and less on the internal thought processes that sometime govern museum management (“inside-out”). The thought-fuel – not to mention the data – in much of what I write about is from my experiences at IMPACTS – and it’s often the first time that much of the data has been published for the public. I blog because every day I’m in meetings with access to insanely awesome, blindside-the-nonprofit-CEO data and analytics – and often that data or topic is important for moving the sector forward. Certainly, a very vast majority of the information that I have from my work with IMPACTS is proprietary, but Know Your Own Bone is a platform to share what I am able with the broader nonprofit sector. In sum, I write Know Your Own Bone because I think it’s the right thing to do and I hope the information is at least a little bit helpful in elevating the sector. I like to think of myself as a private-sector/nonprofit sector double agent (…with permissions). I think this one is still making the rounds and got so much attention because it supplied data for something that museums grapple with constantly – namely, the relationship between entertainment and education for the museum visitor. The last special exhibit that I saw was “Memory Palace” at the Victoria and Albert Museum in London before it closed last week. It was an incredible, walk-in story that brought to life a work of haunting fiction by author Hari Kunzru. The narrative was set in the future, but was about a quest for remembering the past. The story was visualized through a series of commissions by 20 internationally acclaimed illustrators, graphic designers, and typographers. Though this was my most recent “special” exhibit, I’m grateful to work with incredible cultural centers and also to live in cities with wonderful museums and historic sites. Yesterday, I visited both the Dickens Museum and the Churchill War Rooms, and the day before that I was at the Tate Modern. Trying really, really hard to land a spot as a host on MythBusters. I do tweet (Say hi! I’m @cdilly)! I tweet to connect with folks, but mostly I tweet so I can take in and think about bits of the great ideas floating around me. Name the last professional development book you read. Would you recommend it? I just finished “The Dolphin in the Mirror” by Diana Reiss, and it is fantastic! It’s probably not what typical museum folks would consider a “professional development book” because it is about dolphin intelligence and society’s treatment of these animals… but I think the mindset of the book is beneficial and challenges the future of museums. I am captivated by the fact that many European museums are looking to U.S. aquariums to inform their business models (as opposed to U.S. museums). I think this book holds an important aspect of the key to the sustainable museum’s business model of the future… Namely, our dedication to our own social missions and the animals (or objects) in our care. Thanks for participating in Meet a Museum Blogger, Colleen! 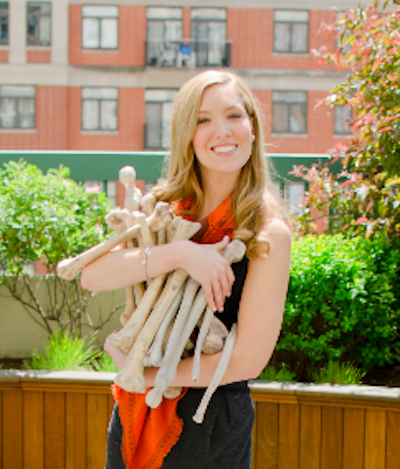 In case you missed it, Colleen blogs at Know Your Own Bone. Do you have additional questions for Colleen regarding her profile above? Feel free to start a conversation in the comments below or reach out to her directly on Twitter at @cdilly. Please use the #MuseumBlogger hashtag. TY! Tags: aquariums, Churchill War Rooms, Colleen Dilenschneider, Dickens Museum, English, IMPACTS, innovative community engagement practices, Know Your Own Bone, museums, MythBusters, Nonprofit management and leadership, Public Administration, Tate Modern, The Art Institute of Chicago, The Dolphin in the Mirror, The University of Chicago, University of Southern California, Victoria and Albert Museum, Visual Arts, zoos. Bookmark the permalink.